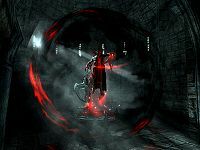 Dawnguard Side: The Dawnguard side of this quest is much like the Vampire side, except that after acquiring the bow, Serana will tell you to head back to Isran. Once at Fort Dawnguard, talk to Isran, who will gather the rest of the Dawnguard. If you chose to become a vampire in order to gain access to the Soul Cairn, Isran will refuse to speak with you until you have been cured. You may obtain this cure from either Aela the Huntress (if you have progressed far enough in the Companions quest line), by turning you into werewolf, or from Falion in Morthal who can cure you entirely. See this article for details. After a short speech, everyone will head out to Castle Volkihar. Once you arrive there, the Dawnguard, including one armored troll, will start the attack on the castle, beginning with five vampires, a few Gargoyles and one Death hound who defend the outdoor approach to the castle. When they have been defeated, you will then lead the charge into Castle Volkihar, fighting the remaining vampires and Death hound. After all the vampires have been killed, follow Isran to a gated off doorway with a pull chain to the right of it. Pull it to raise the portcullis, then head up the steps and through the doors, where you will find Lord Harkon. The conversation with Lord Harkon on the Dawnguard side is somewhat different than the conversation on the Vampire side, mainly in the tone of the conversation and in Lord Harkon's dialogue with the player. 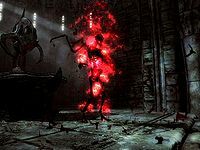 Instead of insulting the player for their lack of loyalty, Lord Harkon will admit that it was only a matter of time before Serana would one day return with hatred in her heart. He then questions the player's allegiance to Serana by asking if she and Valerica are next after dealing with him. No matter what dialogue options you choose, Lord Harkon will eventually demand that you give him Auriel's Bow, where you are faced with the same choice. Random encounters with members from the opposing faction in hold capitals and the wilderness will be less frequent. Random vampire attacks will only occur during an eclipse. You may sell the two Elder Scrolls to Dexion Evicus for 6000 gold after completing this quest, but only if allied with the Dawnguard. This issue has been addressed by version 1.2.2 of the Unofficial Dawnguard Patch; it adds the necessary dialogue in order to sell them while sided with the vampires. If that doesn't work, try disabling and re-enabling the Actor through the CC. Make sure you've already saved the game prior to that. It usually results to one ultimate death blow needed to finally bring him down and initiate the death sequence. The Elder Scrolls may be stuck in your inventory after completing the final quest. Sometimes after you've used Auriel's bow, it can cause your weapons to malfunction, resulting in you not being able to use them. This prevents you from being able to attack with either weapons or magic. Reloading to the latest saved game will fix this, and so will turning into werewolf form if a werewolf. ? After defeating Harkon, you may be unable to interact with Isran. You may interact normally with him back in Dawnguard fort. Esta página foi modificada pela última vez à(s) 15h35min de 23 de dezembro de 2015.